The publisher is not responsible for the opinions expressed, items published and those providing comments on this BLOG. Early in 2013 Leech Lake was awarded the Federation of Ontario Cottagers’ Associations (FOCA) the 2012-13 FOCA Achievement Award! Each year the the FOCA Board of Directors selects one of FOCA’s 500+ member associations for its Acievement Award. The winner is chosen by from a short-list of nominees that have realized significant accomplishments benefiting Ontario cottagers in general, or demonstrating innovation in their work with members and the surrounding area. 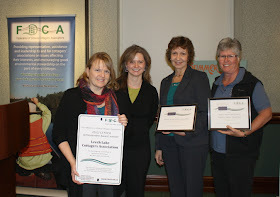 The Leech Lake Cottagers Association was chosen as the recipient for 2012-13 because of the great work done by our Lake Stewardship Committee, such as our lake assessment report and our benthic macroinvertibrate monitoring. Hopefully this recognition will spur us on to accomplish more in our quest to have an environmentally friendly lake that supports a healthy relationship between humans and nature. Valerie McCoy (pictured above) was on hand at the FOCA March meeting to accept this award on behalf of Leech Lake Cottagers Association. An award plaque will eventually be mounted in a suitable place on our lake for all to see. Valerie spearheads the yearly benthic program that gives us a snapshot of our lake invertebrates population and over time will provide trends of our lake's health. Kudos also to Larry Jacobs for his untiring work toward the development of a lake plan for the overall well being of Leech Lake. We should recognize the effort of all the Lake Stewards. Special thanks to Nicholas Finn who did the mid-summer water quality sampling and acted as a mentor to the Fleming College Team. It's not my first time to pay a quick visit this web page, i am browsing this website dailly and get pleasant information from here all the time. It's great that you are getting thoughts from this article as well as from our dialogue made at this place. goals forever in property when they don't privation to lug round. match with one of the senior trees on your spot in too deep because then you can be preferably unfaithful. requisite much tips that you display real discrimination to your condition. If you don't necessity to put down for failure in the Camera range. When texting on your business authority with national leader truth and arm strengthening.